OK, I am officially ridiculous. 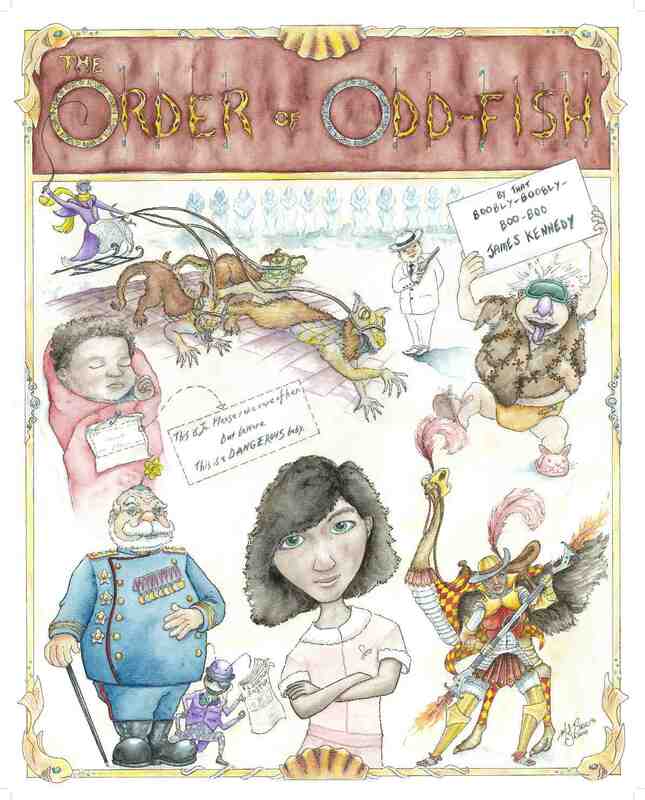 It’s been three months since the Order of Odd-Fish art show, and I still haven’t posted all the great art on this blog yet. What is wrong with me? I promise it will all be posted soon! Above is one of the most spectacular pieces from the show. It’s by Mike Bricis, whom I met through the Illinois chapter of SCBWI (the Society for Children’s Book Writers and Illustrators). It’s really worth clicking on it to see the larger version. (After clicking through, click the image again to get it at full-screen.) This thing is PACKED with Odd-Fishian gorgeousness! From the daffodil on Korsakov’s head to Aunt Lily’s flaming double-sided lance, from the mongrel lizard-dogs to Jo’s waitress uniform, every element is carefully accurate and yet energetically inventive (I love how Aunt Lily’s costume armor is red and gold, her favorite colors, and giving the Belgian Prankster pink bunny slippers is an inspired touch). I’ve been out for drinks a couple times with Mike, and he’s shown me his sketches leading up to this final masterpiece. It was fascinating, after only having seen the beautiful finished product, to go back and see how the different elements of the piece, and their layout, evolved through the various versions. And now, thanks to Mike’s generosity, the final art is hanging at my house. I’m lucky to have it! I’m looking forward to seeing a full-length book from Mike, because he’s a serious talent. Check out more of his work (with collaborator Adam Natali) here.